It’s not just about turning up to play on the night: maintaining your equipment is a must for any professional guitarist, says Don from Millennium Bug. Here’s a handy guide to looking after your guitar or bass in eight easy steps. If your neck is clean and smooth you will play better and your delicate fretboard will last longer. Start by taking off the old strings. You need to clean the neck and behind the frets – a clean, soft rag and some low-grade mineral oil is all you need. Avoid lemon oils: these are advertised convincingly but often contain silicones and additives that gunk up the grain. Some techs even believe that lemon can even shrink and crack a maple fretboard. Why not avoid it altogether and just use mineral oil or a specialist oil-based wood cleaner/restorer with few additives? Use the oil sparingly and buff it off thoroughly before you put strings anywhere near the neck. If you prefer, on an unfinished (oiled) fretboard, you can use 0000 grade steel wool which will safely remove dirt and make your frets shine – just keep the wool and its residue away from anything painted. You’ll probably want to oil the fretboard lightly after this anyway to keep it protected. If you have a finished maple neck, you’re in luck. The lacquer applied in the factory is resilient and can be treated like any other paintwork. Fender guitars and those with a satin finish on the neck have many of the same properties, though they have a different type of lacquer. Make sure you don’t use an abrasive polish on a satin neck – you’ll make it shiny – and never use steel wool on any kind of lacquered neck. You need to protect your guitar’s surface from minor damage and you probably want to add lustre so that it looks good under stage lights. If your guitar is painted this is simple. Establish whether it has the old-fashioned nitro-cellulose lacquer (most Gibsons and some new Fenders do) and if so, skip the next paragraph – it’s sensitive stuff. Most modern guitars are finished with the equivalent of automotive paint. They have a clear coat layer which can be gently buffed with a mild automotive-type polish to remove swirl marks and hairline pick scratches. Cover up all your parts, especially pickups, use a clean cloth and don’t be afraid to use several applications to really buff out those imperfections. Don’t use a powerful abrasive and do not use rubbing compound – this can eat through to the base coat at frightening speed. your paintwork in one wipe and the difference is immediate. Try not to use anything containing d-Limonene, alcohol, solvents, lemon oil or silicones on your paintwork. 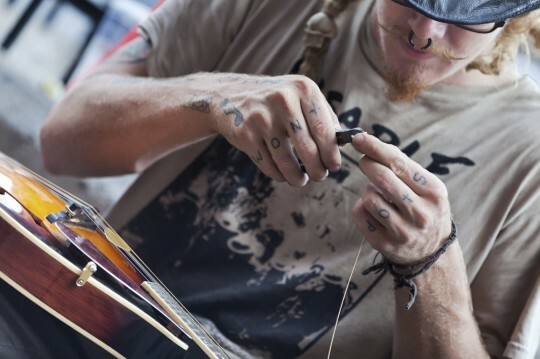 Any part of the guitar that your string touches is absolutely critical for tone and tuning stability. If your frets are dull and they have minor imperfections, you can mask off the neck using painters’ tape and restore them very easily using 0000 grade steel wool. Cover up the body and the headstock before you do this. If your frets are pitted or uneven, or if you have dead spots that can’t be cured by adjustment, it’s time to visit a good tech. If you have a traditional nut, check whether the slots are clean and smooth. You can use graphite shavings from a pencil in the slots to reduce friction and improve tuning stability. If your nut slots need re-cutting, this is best left to a good tech. Locking nuts and saddles can be easily unbolted and replaced if they are badly grooved or pitted, and bridge saddles too. Any dirt, grooves or inconsistencies here will ruin your tone and can break your strings. Sounds easy, doesn’t it? But there’s more than one way to skin a cat. You probably have your own method for stringing your guitar or bass quickly, but remember two things: new strings must be stretched in, and the number of turns on your string post affects tuning stability. To counteract poor tuning stability with new strings, stretch them in. Tune the string to pitch, grab it at points along its length and cautiously but firmly wiggle it from side to side. A centimetre or so in either direction is fine – basically no further than you would bend the string during ordinary playing. Now retune and repeat until the string holds its tune. 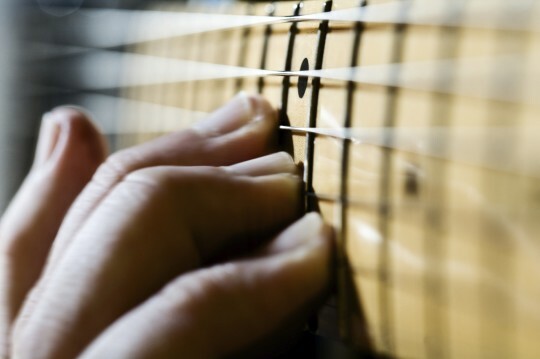 One of the main causes of poor tuning stability can be having too much string wrapped around each string post, as each turn of string can bind to the next where they touch. This causes your tuners to behave erratically, and it means that every time the string moves (during bending for example) it can return to a slightly different position, affecting its pitch. To counteract this, try using as few turns as possible while maintaining a secure connection to the post. This is critical with vintage tremolo-equipped guitars like a Strat, far less critical on a bass, and not critical at all with a locking nut (but still good practice…) Keeping a Strat in tune could be the subject of a book; a quick internet search will reveal all kinds of techniques including staggered string winding, staggered string posts, graphite nuts, oiled nuts and much more. This is the simplest and most misunderstood of all guitar setup jobs. Make sure your strings are new, make sure they are tuned, and now adjust the action downwards until it buzzes somewhere on the neck. Now adjust it back up a hair until the buzzing stops. Repeat for every string and your action is set. If you prefer a medium or high action or if you’re setting the guitar up for slide your job is easier. Just do the same thing but this time back it off a bit further until you’re happy. Same process, wider tolerance – aren’t you lucky? If you can’t get a good compromise between action and buzzing, your string bends choke out, or if you have dead spots on your neck, something is wrong. Assuming your frets look OK, move on to the next stage and come back to the action when things are right. Most guitars are designed to operate either with a dead straight neck (less common) or with an almost imperceptible bow (more common). The curvature of your neck will change with the seasons and in all kinds of other situations. You can assess the condition of the neck very quickly by sighting down your neck from the headstock end. It’s normally easier from the bass side – the bottom ‘E’ string acts as a ruler and is easy to see. If you are experiencing dead spots, incurable fret buzz or poor action that can’t be improved, your neck may be too bowed or not bowed enough. If you need to adjust your truss rod, do it with the right tool and in small, even increments so that you can remember where you’ve been. If you have too little travel, a bow that cannot be adjusted out, buzz that won’t go away, or if you’re needing more than a turn or so of adjustment, it’s time to get a professional on the case. Your intonation should be checked after any mechanical adjustment elsewhere on the guitar, and after any change in string gauge, sometimes even string brand. With an electronic tuner this is incredibly simple. Play the 12th fret harmonic and use the electronic tuner to get it perfectly in tune. Now fret the string at the 12th fret, right next to the harmonic you just played, and look at the pitch on your tuner. If your string is correctly intonated it will look exactly the same. If it’s flat, move the corresponding bridge saddle towards the pickups slightly, retune and check again. If it’s sharp, do the opposite. You can remember which way to move the saddle with the simple mnemonic “FFF” (fret flat forward) and it’s a simple case of trial and error to find the right position. On most guitars, intonation is adjusted with a single screw. On Strats, the screw is on the rear edge of the tremolo bridge and most traditional guitars and basses – even those with a stop-tailpiece – have a similar arrangement. On vintage-style Teles with only three saddles you have to achieve a compromise for each pair of strings. 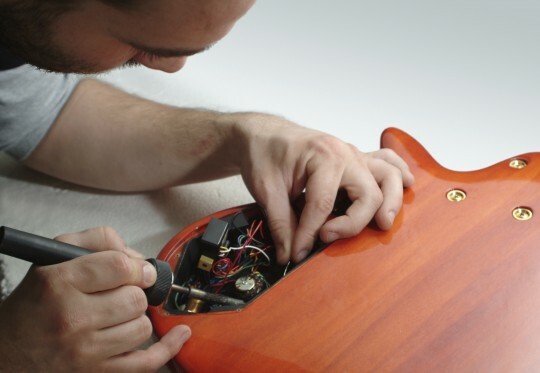 Intonation adjustment is one area where Floyd Rose-type locking bridges fall down – the adjustment is made by loosening a tiny hex nut frustratingly situated right under the string – then moving the saddle by hand and re-tightening. 8. Is everything else in order? Are your pots scratchy? Clean them with electrical contact cleaner. Is your output jack loose and crackly? Get the soldering iron out – it’s two easy connections on a passive instrument, three on an active. Are your cables and connectors dodgy? Be a pro and buy some new ones before the gig. Your amp is complex, potentially lethal and should not be opened up by anyone untrained. A tube amp has parts inside that can kill you even when it’s switched off and unplugged. Having got that out of the way, the most important thing to remember if you’re using a tube amp is this: tubes are a lot like lightbulbs and they are made of glass. Lightbulbs can blow without warning and glass is normally moved around with care. If you’re not carrying a full matched set of power tubes and at least three or four preamp tubes in a padded box, you may as well go home. Preamp tubes can last ten years, or they can fail without warning and they often (but not always) go dim when they do. Replacement is plug and play – don’t be afraid of trial and error, don’t be afraid to mix and match within spec, and make sure your amp is switched off first. Power amp tubes (the big ones) are more tricky. They should be replaced in a matched set and they ought to be biased by a trained tech for reliability and tone. You can break either of these rules to get you through a gig but it’s like using a spare wheel – you have to take your amp to a tech to get the job finished before the next time you use it. The current inside a tube amp can kill you in a second, so don’t stick anything in the tube sockets other than tubes, don’t open up the chassis, and switch the amp off before doing anything – if nothing else these things get hot. Nobody likes stress before a gig. If you don’t have a good amp tech, ask players you trust and you will find one; and if you think it’s OK to gig without either a spare set of tubes or a backup rig, consider a different profession. Don is a writer, music producer and lead guitarist in Millennium Bug. Function Central is a live music booking agency, providing function bands, musicians and DJs for weddings, parties and other private events UK-wide.